Cut 1/2 inch off top and bottom of each zucchini. Using julienne vegetable peeler, pull peeler down sides of zucchini, making long narrow strips; stop when getting to the seedy core. Repeat with other sides of zucchini, until you have about 2 cups of zucchini noodles. Repeat with remaining zucchini. Discard cores or save for another use. In medium bowl, mix soy sauce and vinegar. Add zucchini noodles, and toss to coat. Set aside. Heat wok or 12-inch skillet over medium-high heat until hot. Add half of the sesame oil, then immediately add chicken and salt. Cook 1 to 2 minutes or until brown; turn to brown other side, about 2 minutes longer, then transfer to plate. Add remaining oil, then bell peppers and green onions, stirring constantly, 2 to 3 minutes or until softened. Add curry paste, and stir until fragrant, about 30 seconds. Return chicken to wok, and stir. Add coconut milk; cook 3 to 4 minutes, until liquid is absorbed. Remove from heat, transfer to bowl, and cool 5 minutes. To serve, divide chicken mixture among 8 lettuce leaves. Drain zucchini noodles, discarding sauce, and place on top of chicken mixture on each, followed by peanuts. This versatile meal can please grain-eaters, too. Just save the dressing from the zucchini, double the coconut milk, and serve everything but the lettuce over 4 cups of cooked Thai stir-fry rice noodles. When stir-frying, be sure to have all of your ingredients prepared before heating the pan. Proper preparation makes for a stress-free and successful stir-fry every time. If you don't have a julienne vegetable peeler, you can use a regular peeler, being careful to peel strips as narrowly as possible. Or you can cut the zucchini into long thin strips 1/4 by 1/4 inch, discarding the seedy core. 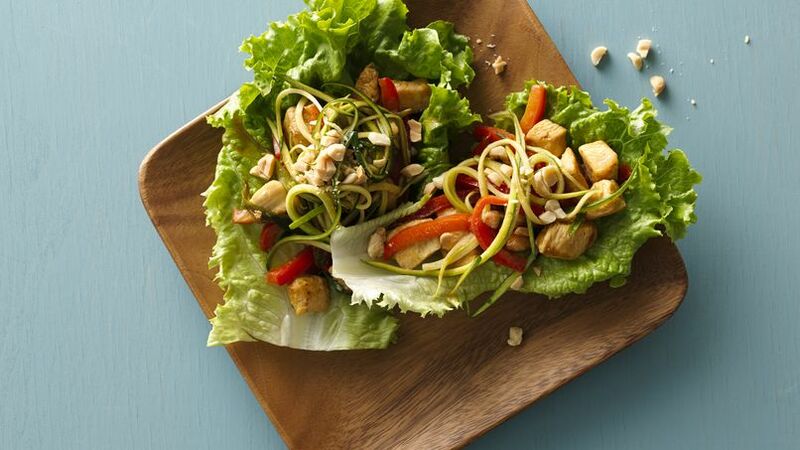 Try Thai tonight with this quick and simple lettuce wrap filled with fresh, healthful flavors sure to add some "wow" to your weeknight dinners.